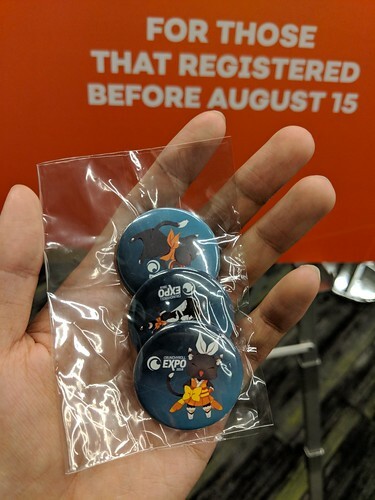 Crunchyroll Expo 2018 | Topic "Otaku"
Posted by coolmikeol in Events, Otaku. 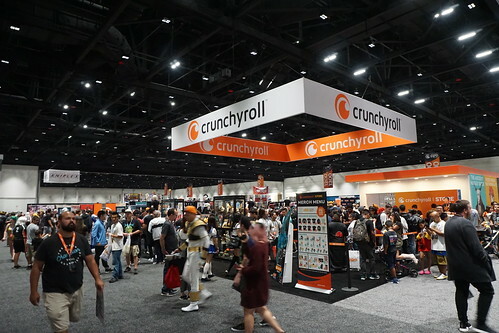 I went to Crunchyroll Expo 2018 (CRX), Crunchyroll’s second year running the anime industry-focused convention, which took place on September 1st through 3rd at the San Jose Convention Center. Unlike last year this time I went on my own, but just like last year I only went for the first two days as there wan’t much on the schedule that interested me enough for me to go back on the 3rd day. For all my photos taken from Crunchyroll Expo 2018, please check out my Flickr set Crunchyroll Expo 2018. I woke up at around 7am, which was normal for me as I’m used to waking up at that time due to getting ready for work on weekdays at that time. I planned to get to the con area by around 10am, so I got my stuff together, and left to drive down just past 9am. Because it was the weekend, I knew where I could get free parking with validation during the two days. There’s a diner I always go to called Peggy Sue’s that’s a block away from the convention center. If you eat there and spend at least $5 you can get your parking validated which can save you $10. For a breakfast that also counts as my lunch for just a little over $7, plus free parking, I think that’s a deal. 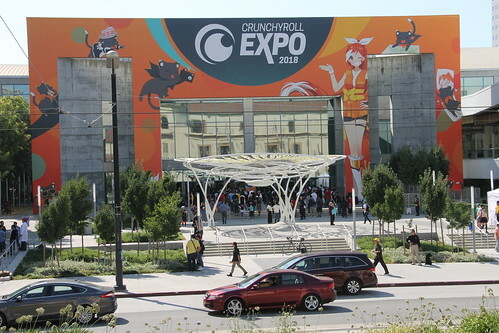 Upon arriving at the convention center, you can see that the front was fully decked out in Crunchyroll colors and mascots. You could also see a bunch of security around, as well as lines from the front entrance. This is what I observed in comparison to when I come to this convention center for FanimeCon. I’ll probably be comparing CRX to Fanime every so often in this post, but in general they both are their own events, with their own vibes. After taking the first shots of the con from across the street, it was time to get inside. I already had my badge courtesy of CRX mailing theirs out to people who order theirs before a certain date. The only thing standing in my way of going in was a security checkpoint. This was a straight-up airport like security, with a bunch of security guards and metal detectors. It may sound like a lot, but honestly it wasn’t too bad. I didn’t have any bags on me whenever I went through these, just a couple cameras, my phone, badge, and coins. At least I didn’t have to remove my wallet, belt, or shoes, but I’d imagine if you were a cosplayer, getting through would take longer, especially if you had metal in your costume. After the security, you just needed to tap your badge to the Persona5/Cells at Work readers and you were in. 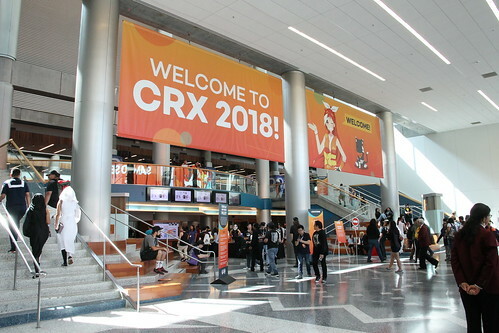 The first thing you would notice in the main lobby was the giant “Welcome to CRX 2018!” sign alongside Crunchyroll Hime and cat. At the center of the lobby were the program guides and daily schedule, as well as Fate/Grand Order lanyards. Just beyond the lobby was an open area for photo ops, as well as the info booth. Going up to the second floor, there was a DJ playing primarily anime music at the balcony overlooking the convention lobby. There was a sign on the table which read “Song Requests”. Naturally I went up and added a song to the list, which was “GravityWall”, which was the first opening song for the anime Re:Creators. To my surprise, not long after I put it on the list did the DJ play it, albeit in a faster manner probably to match his music mix. I was happy none the less that a song from an anime I feel is relatively underrated was played for a large amount of anime fans at an anime convention. The main attraction on the second floor was the Exhibit Hall/Artist Alley which was all located in the same giant room. I liked that there was carpeting in the Exhibit Hall side, as it was pleasant for everyone walking around. Not just by its look, but also because it softened the impact for our feet as well. Notice I mentioned the Exhibit Hall side; the same was not true for the Artist Alley side which just had the cement floor. Not much of a big deal, but something I noticed none the less. The room was very big as it was a combination of the Dealers Hall and Gaming room of Fanime. Besides the Exhibit Hall and Artist Alley, the room also contained the arcade and autograph lines. The autograph line area was fine, but the arcade was really small, with only one way in and out. I feel that they should of used one of the other small rooms on the same floor of the convention center for the arcade instead. There would have been more room, for either people moving about or for more games or both. The planned to attend the Opening Ceremonies which was to start at 11:30am. After my brief touring of the con I headed to the Main Stage which was located in the area where Artist Alley is at Fanime. 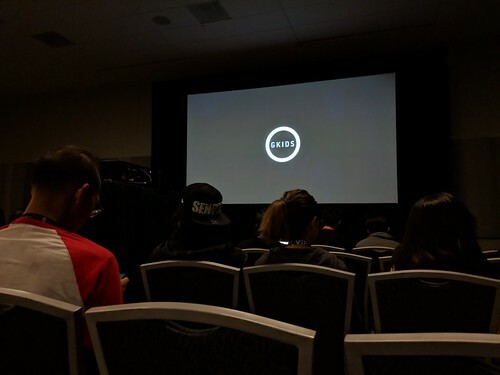 I liked how the stage looked, reminding me of how Anime Expo has their main stage usually set up. The ceremony started pretty much on time, and started with a video about how Crunchyroll aims to bring together people of all kinds, as a kind of advertising for inclusion. 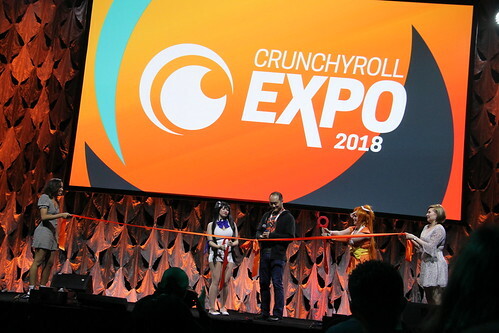 After that and a few cringy Crunchyroll shameless adverting later, the ribbon was cut and the con was officially open. At this point it was about noontime and I decided to walk around to see whatever else there was to do. I went to the Fulfillment Center and got some pins, as well as a DragonBall drawstring bag and additional mystery pin. (The drawstring bags and mystery pins were the same ones that I was helping Crunchyroll give away at Anime Expo this year.) I went back into the Exhibit Hall and did a more through look at whatever drew my interest, but didn’t buy anything. Shortly afterwards, I headed back to my car to take a break. I saw on the schedule that there was a premiere for the English Dub of an anime movie called Maquia at 5pm. I originally was going to leave early if I felt I was done for the day, but this peaked my interest enough to go watch it. I didn’t know anything about the movie, but I did remember seeing it before I think at Anime Expo being advertised. Before they started the film, the presenters of the movie mentioned something along the lines of “tissues not provided”, basically saying that it was going to be a sad one. On the schedule, it was noted that this film was by Mari Okada, and she has worked on a number of notable shows I recognized such as AnoHana (I have not watched this yet), Nagi no Asukara, Mobile Suit Gundam: Iron-Blooded Orphans, and Toradora! I’m so glad I decided to watch this movie, which is called Sayonara no Asa ni Yakusoku no Hana wo Kazarou, or by its English name Maquia: When the Promised Flower Blooms. Everything about the movie was great: The visuals, the music, the voice acting, the raw emotion. I could relate to the emotions the characters were experiencing, which made it such a compelling film. I teared up multiple times, but I tried to them back as I was in a room full of other people. Probably if I was watching the movie on my own I’d let the emotions flow through me to truly enjoy those moments from the film the way it was made to. I’m not going to spoil the film for you, so just trust me that you should watch this film if you enjoy a good sad anime movie. I also want to watch this movie in Japanese as well (English Subbed), as the English Dub did really well too (though there may have been some direct translation issues in terms of context). The English Dub will be coming to certain US theaters later this month, and I do plan to watch it with friends that haven’t watched it yet. Luckily it will be showing in my city, so I just have to watch out for the tickets when they start selling it. I may even try to buy the DVD/Blu-Ray of it, and I don’t even buy the physical copies of my favorite anime. That’s how much this movie impressed me. After the movie ended, we were given a poster of the movie, which I actually have framed. I headed home on a good note, and prepared for the next day ahead. Morning of the second day started just like the first, though I didn’t feel the need to rush as much as the first thing I wanted to check out started at 11:45am. I figured that I’d aim to get to San Jose by 10:30am so that I could get breakfast from Peggy Sue’s again for parking validation, and get to the convention by around 11am. Everything went according to plan, and by around 11:20am I started to scout the line for the next event I wanted to check out. We were able to enter the room early enough for me to get a decent seat for the viewing. 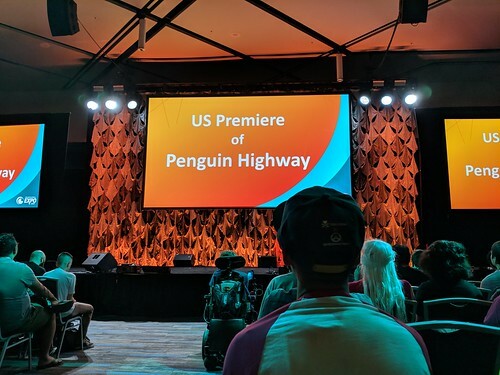 This was another anime movie premiere that I briefly heard about that sounded interesting enough for me: Penguin Highway. I only heard about it at the opening ceremony, but at the time I didn’t really pay much attention to it. Probably what got me to check it out was that there wasn’t much else to do besides it at CRX at the time, and a movie about penguins sounded like it was going to be a funny kind of movie. While waiting for the movie to start, I looked into the movie a bit on my phone, though not going further than a synopsis about a young boy figuring out the mystery of the woman who could summon penguins. I can tell that most people in the room didn’t know what to expect; the people behind me were joking around saying that the movie will probably be a funny one or a straight up serious one, either way they’d enjoy it. I honestly didn’t know what to expect, but I thought of it as a good thing, as I enjoy being surprised when watching a good film. Penguin Highway was a funny, entertaining flick with some supernatural elements. I’m not going to spoil the movie so I won’t say much, but it was another enjoyable film that added another highlight to my CRX 2018 experience. It was quite a long movie, nearly two hours, but it was a fun ride. The room we were in (which was the big main stage room) was nearly full when I looked around towards the end of the movie, so you can tell that audience retention was there. This is another anime movie I’d like to share with my friends and family, so if I ever get the chance to show it to them I would. After watching Penguin Highway, I went back to my car to take a lunch break and afterwards returned to wander the con before the last event I wanted to see, which was a showing of the anime film Fireworks at 5:45pm. I already heard of Fireworks, first time was from some con friends who were going to watch it around the time of Anime Expo. I also saw the music video on YouTube which is probably where a lot of people first got a glimpse of it and wanted to see the movie version. I did hear that it wasn’t that great a film, but since this showing was part of CRX I thought to myself “Why not?” The rumors about it not being great were pretty much true. There was a few things that bugged me throughout the movie, but it was still watchable none the less. I wished that Fireworks was not the last thing I’d see/do at CRX because of its mediocrity, but that’s exactly how my CRX 2018 con experience ended. Before I left the area, I took a few photos of the con as the sun set for both the second day and my last anime con of the year. 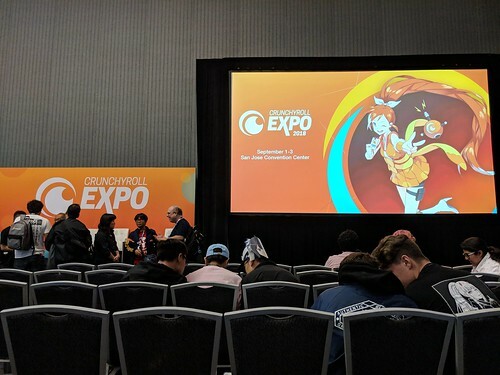 When Crunchyroll Expo announced that they would be at the San Jose Convention Center this year, it was something that many of us were interested in. 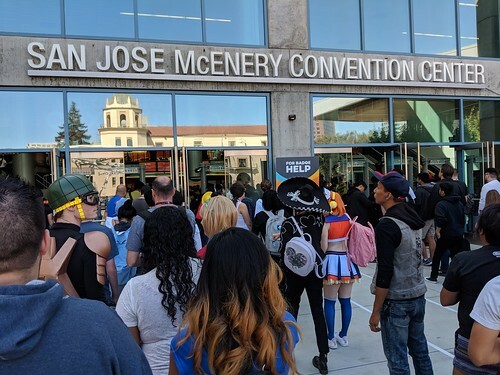 Because of how much the SJCC is known as the home of the FanimeCon (Even one of the hosts of the CRX Opening Ceremony mentioned that it felt like Fanime 2), it would be an interesting experience going to another anime convention there that wasn’t Fanime. Even if we were all familiar with the area, the layout and conduct of everything would be alien. 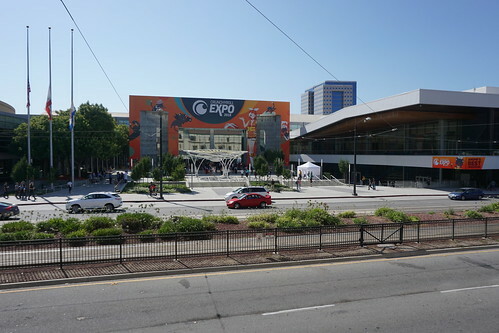 For example, CRX seemed to be limited to just strictly the convention center. I don’t recall seeing the connecting hotels being used like how Fanime uses them for panel rooms and the like. 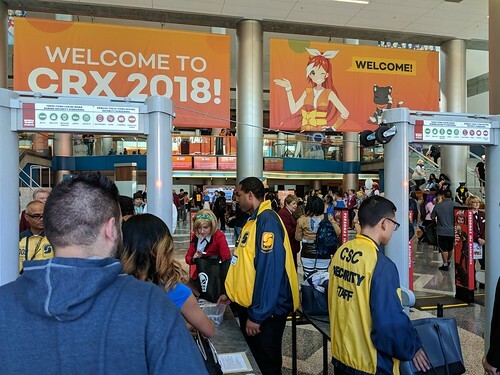 Security has been improving at the SJCC over the year, though they were in full force at CRX with their metal detectors and guards lining the entirely of all entrances into the convention center. That is one thing that I don’t think Fanime will force upon its attendees, similar full security checkpoints, unless more tragic events happen at similar venues that force safety over convenience. I like being able to go in and out with relative ease, especially when cosplay photo ops are quick to miss. What was surprising was that I thought at first that I’d be feeling Fanime vibes from this con, because of how we’re used to the SJCC being Fanime, but it felt quite different in a good way. I already mentioned how the Exhibit Hall was, and it felt more professional than Fanime’s or other similar cons. The vast open spaces of the con had some seating placed more so for decoration in my opinion, which again looked something more from an exhibition than a fan con. The main stage room impressed me with its look, comparable with Anime Expo’s main stage setup. I guess the biggest kicker in this was that there was a lot less people than Fanime, which at first made it feel dead at times, but at the same time made it easier and overall enjoyable to not deal with massive waves of people blocking walkways and the like. CRX also had an smartphone app, similar to what Anime Expo has where you could access con info like schedules, maps and the like. I do like the idea of conventions giving us the convenience of having everything we need to know in an app. I downloaded it ion the first day and it worked great…. for maybe a few hours before it crashed and never booted again. I tried to update it and stuff but it would always immediately crash upon loading up. At least there was plenty of paper schedules, but the point is that they should have stress tested it before using it at con. I do believe that CRX is aware of this issue and will fix it in their future events. Overall I enjoyed my short experience at CRX 2018. It’s a shame that I didn’t take photos of cosplay during this con like I would Fanime, but because of difficulty of going in and out of con at will, as well as my focus of the new venue location, it was partly expected on my behalf. Normally I’d be bummed out that I didn’t take a lot of photos, but these days I’m also trying to balance my own enjoyment of the event as well, which is best experienced when not trying to photograph/record it. I also spent very little at this con, probably the least out of all I’ve ever went to. Not counting the cost of the badge which I bought months ago, I spent no more than $15, none of which was actually spent at con. All of my costs went towards food which was my all day meal, with the perks of also having free daily parking during the weekend. I got a bunch of freebie stuff, like lanyards, pins, and posters so it’s not like I got nothing material from the con. 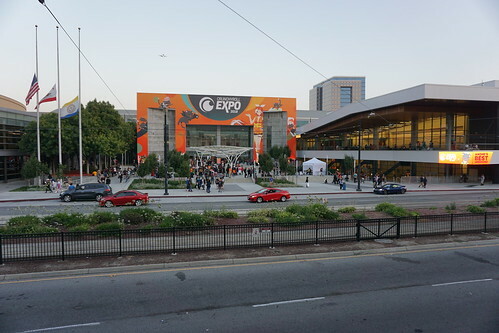 I’d be interested in going to Crunchyroll Expo again, as I do see it learning and improving in the years to come.